EGWs6uuBZ3pp-zGuVVdmeLgkJG4 Across the Avenue: Woolzies Dryer Balls...Giveaway! Since moving into our new house, we've learned a lot about energy-saving techniques. Our home was designed with energy star efficiency, which has made a shockingly noticeable difference in our utility bills. It's also sparked our interest in finding more ways to be energy efficient! A rectangular carton of six Woolzies Dryer Balls came in one package. I opened the package and immediately noticed how dense the balls are. I read the insert that came in the box, which explains that these balls are all-natural (score!) wool, eco-friendly, and fight static cling and wrinkles. The directions said to toss all 6 balls into the dryer with a normal size load of laundry, without the need for fabric softener, so that's just what we did. Then we tossed all of our wet laundry in to the dryer with them and let them do their job. You can definitely hear the balls spinning around in the dryer, which took me by surprise initially. However, once I walked out of the laundry room, I couldn't hear them at all. So how did they do? We usually set our dryer on "More Dry" to fully dry our clothes. I tend to wash larger than normal loads of laundry each time, so a regular load setting typically doesn't dry our clothes enough. This time I decided to try the regular setting in hopes that the Woolzies would come through for me. When the buzzer went off I ran upstairs to check on our clothes right away. When I opened the door and pulled out the laundry, I found an entire load of completely dry clothes wrinkle-free with no static cling! This was a very exciting first try. We now use our Woolzies dryer balls on a regular basis. Each time we pull laundry out of the dryer we toss the balls back in the dryer and just keep them there for the next time. They have made a noticeable difference in how fast and effectively our laundry dries. As far as static is concerned, Woolzies do a decent job, however, my nylons and knee highs still cling to my clothes. In Woolzies' defense, I have yet to find anything that totally stops them from clinging to my clothes. After many loads using Woolzies, we can say that it has definitely cut down on wrinkled clothes, especially during times that we leave the clothes in a bit too long. It's obvious that these dryer balls are an asset in drying my clothes, which saves us money as far as our electricity bill is concerned, but they also save us money on dryer sheets. Each set of Woolzies is supposed to last about one year. That's a ton of savings in a year, considering you can get a package of Woolzies for less than $40! For a product to be all-natural, energy efficient, eco-friendly, and a money saver, how could I not recommend this to others? Woolzies has met and exceeded our expectations and we are very happy that we gave them a try. 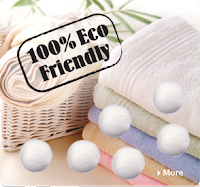 Want to try Woolzies Dryer Balls for yourself? Enter below!! Disclaimer: As always, our reviews are our own, honest opinions and may differ from yours. Sassy Shopper Reviews is not responsible for prize fulfillment. No monetary compensation has been given to review this product. We use energy effiecent bulbs, and make it a habit to keep lights off if we aren't in a room. We have the a/c go higher during the day when we are not home. I try to turn off the lights as much as I can. We always unplug everything and only use the heat/ac if we absolutley have too! We turn down our heat when we're out of the house in the fall and winter to conserve energy! I try to remember to unplug my husband's cell phone charger when he is not charging his phone! I turn off the lights when I leave a room. We turn off the lights when not using a room. I just do my best not to waste. I keep lights off when they aren't needed, don't let water run, etc. I turn off lights when I am not in a room and use natural sunlight during the day. I use energy efficient light bulbs in my entire home. We turn the heat down during the night, and only use it (or the A/C) when we really need to. I do most laundry in cold and try to keep the lights off in rooms we are not in. We use space heaters at night. We do laundry in the morning when the rates are cheaper. I try not to run the A/C until it is 80 inside. I love my dryer balls. I have been saving my dryer lint for a year to make "logs" for my fireplace, I also collect pine cones for the same reason. so want to try the dryer balls. terri.moore30@yahoo.com thank you! Cut down drying time and reduce wrinkles? Yes, please! The water I run before my shower is hot is reused to water the grass / plants. I have shortened my shower time down. We unplug appliances and cell phone chargers when not in use. Always turning off the lights...simple but important! lights are off if we are not in that room- doorsa shut to keep heat in main room-- extra blankets on the bed when it starts to get cold- appliances unplugged if not in use. I use a programmable thermostat so I don't have to keep the house as cool while I am out.